Cadillac replaced Fireman. Keshin Black replaced Skanda. Rudos took 2/3. Dr. Cerbero replaced Killer Jr. (moved up.) Danny Casas & Veneno had problems leading them fighting each other after the match. No Hijo de Dos Caras again, with Killer Jr. replacing him. Despite being on the losing side, Pirata challenged Electroshock to a title match, which was accepted. 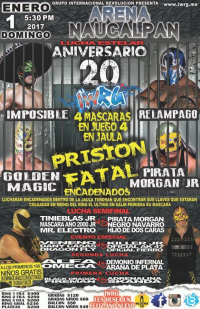 First Tinieblas match in IWRG since 2013. 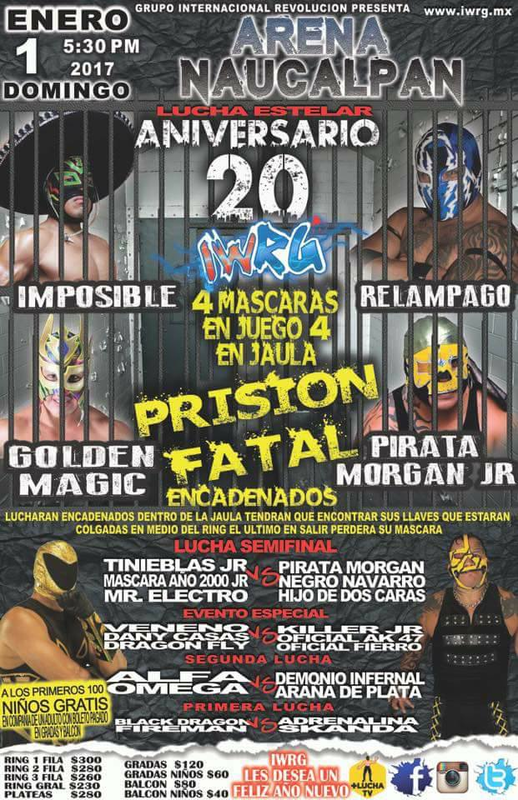 Imposible beats Pirata Morgan Jr., who was unmasked. Pirata Morgan Jr. was announced as Pedro Ortiz Soto, 35 years old, 15 years f a wrestler, from Mexico City. Mike was hurt after a Demonio move. 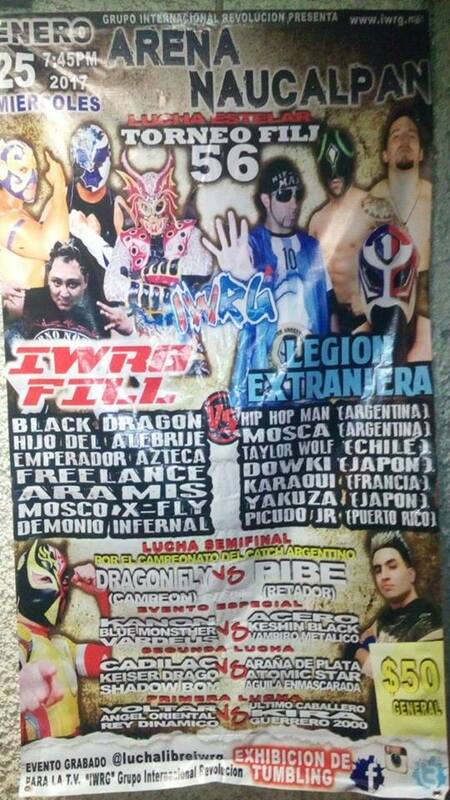 X-Fly's first IWRG match in 11 months. Trauma I used the ropes to beat Mascara 2000. Pantera was stretchered out after hitting the barricade on a missed tope. 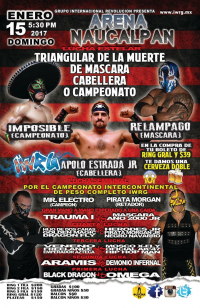 Trauma I wants a title match, Mascara wants a super libre match first. 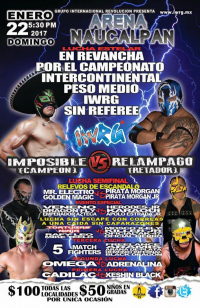 Herodes first match in IWRG since September. mistakenly listed as Welterweight on poster. Third defense. Impossible won by DQ when Apolo Estrada Jr. returned and caused the DQ. 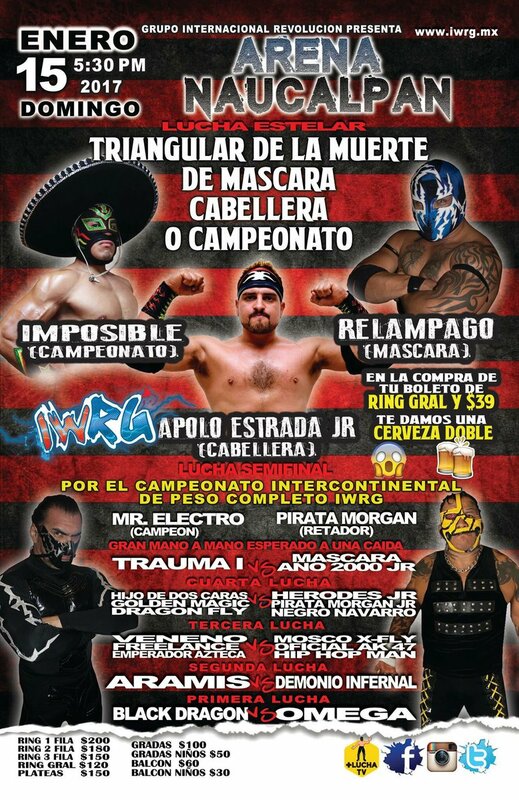 Apolo wants a match with his hair vs Relampago's mask vs Imposible's title. Pirata hit the ref with a chair and blamed it on Electro. Pirata wants a heavyweight title match. Electro wants a hair match. Hijo de Dos Caras actually showed up! He feuded with Herodes. Mascara didn't get back from Jalisco in time, so Herodes Jr. worked in his place and lost. Apolo lost his hair to Imposible in his first match here since July. 4th defense for Imposible. Aramis & Demonio Infernal submitted Arana de Plata at the same time, which the commission decided wasn't a finish. Those three continued until Demonio Infernal beat Aramis. 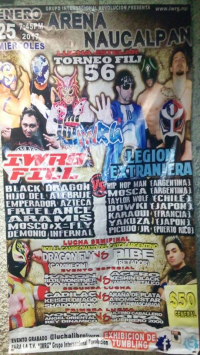 Eterno returned to IWRG after the match, looking to start a group with Demonio. Prior to the match, Hip Hop Man announced a show on Wednesday featuring his group of foreigners against Mexicans. 911 & Eterno (first match since) replaced AK47 & Fierro, Freelance replaced Leo. Listed as without referee. Relampago pulled Imposible's mask to win. 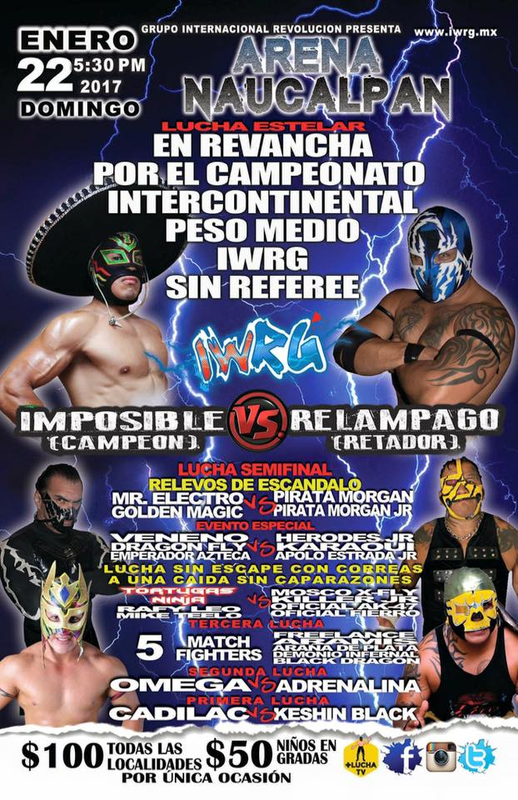 Imposible falls on his fifth defense and now wants a mask match with Relampago. Torneo FILL 56, FILL vs Legion Extranjera. Eterno replaced X-Fly but he and Demonio Infenrla were having problems all match. Mosca (who's chest was blood red from chops) beat Emperador when Hip Hop Man threw power in Emperador's face.